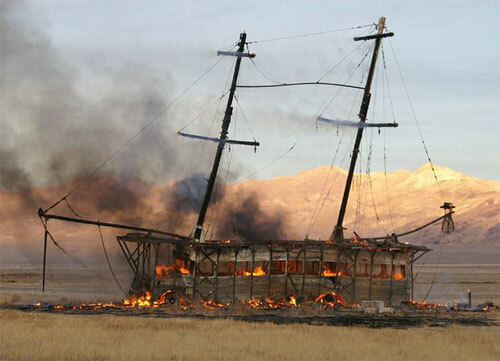 I just found out the sad news that the amazing and beautiful “La Contessa”, Extra Action Marching Band’s 60’ Spanish galleon that sailed around Burning Man in previous years, has been destroyed in a fire. At this point we do not know if it was an accident, burned on purpose or if it was arson. If anyone has any additional information regarding what happened, please leave a comment. UPDATE 3: On Friday, February 2nd hundreds of people showed up for a La Contessa Burial at Sea.